Imagine being lost and stranded in the desert. Would you know what to do to survive? 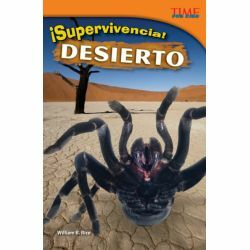 This useful, Spanish-translated nonfiction title explains the important skills needed to survive in the desert. With helpful diagrams and images, definitions, tips and instructions, informational text, a bibliography, and a list of other helpful websites, readers can be assured that they will learn about the dangers of heat exhaustion, desert plants that could aid in survival, and other helpful tips in order to survive in an emergency.